You'll note color coding on the options. Most member options are color coded in Blue. Moderator functions (with the exception of Edit, which is available on member's posts, so they can edit their posts) are color coded in purple. I'm going to discuss the grey options for action that can be taken on a post. You'll see a four different reply options. Second, at the bottom of the text box for the post you're reading, you have three options: "Quick Reply," "Reply," and "Quote." Quick reply won't bring up the full formatting options. You can just type in quick text and enter it. 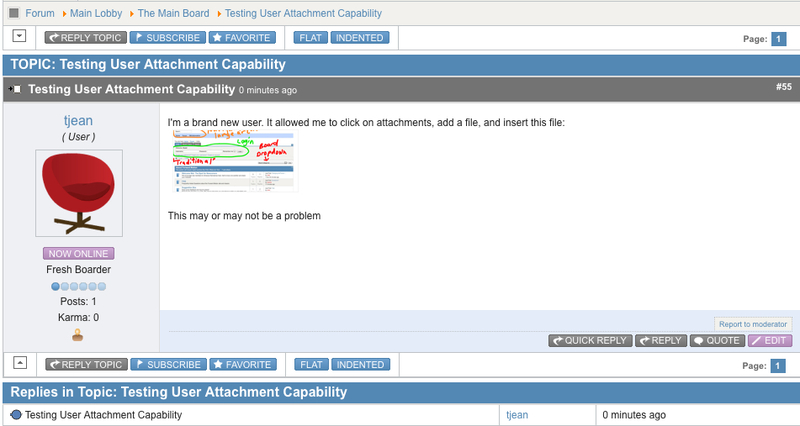 If you want a more detailed reply with the ability to easily click and add formatting, click "Reply." If you want to quote the post you're replying to, select "Quote." If you're not looking at a post you've entered (which this example is), you'll see a button for "Thank you" on the left side of the reply/edit ribbon. If you just want to acknowledge the post with a "thank you," click that button (This will save a bunch of messages with Thank you in the subject lines followed by (n/t)). Look at the tiny box above the Quote and Edit boxes. See where it says "Report to moderator"? If someone has made an inappropriate post, one that clearly violates the TOS, or if you're not sure and want a Moderator to check it out, click that box.